OH MAN GO TIME GAIDEN: SECOND DEMO!!! 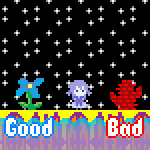 It's been about 5 months since I released the first demo for Oh Man Go Time: Gaiden, so I figured it was overdue for a new one. There's actually a lot of new content that wasn't in the old demo; in fact, the game goes right up to the very beginning of Drugs' evil lair. I'd also like to announce that I'm taking bit of a break from working on this. Now don't worry, I'm still planning on completing this (someday), it's just that for the time being I'd like to focus on smaller Knytt projects. Making stuff for Sergio's one-room competition has made me realize that I work better with smaller, concentrated levels than bigger, sprawling levels like this one. This doesn't mean I won't try to make more epic-sized levels in the future, just that I'll work in a couple bite-sized levels in between them. Here is another one of my dumb Knytt Stories. This time it's a challenging level, though? I was supposed to release this for the Video Game Name Generator jam, but I kept getting distracted by other things. Anyway, it's a pretty standard collect-the-key hunt with a few twists here and there. Let me know if you come across any bugs or anything. Thought some of the folks who visit here might be interested in a Knytt Stories level I made over the last 6 days. Download link and further information can be found at the thread on Nifflas' Support Forum. So, hey! Haven't been here for a while. How about a little Knytt Story to make up for lost time? I actually started making this for a level competition on the Nifflas forums (the basic theme was "keys," although it was a little more complicated than that), but I never finished it in time to enter. I decided early on to make it a maze-type game, even though I hadn't had any experience at all with building mazes. I think the inexperience shows, frankly, but at least I gave it some nice scenery. So there's this ongoing Knytt Stories level competition thing over at Nifflas Forums. One comp in particular requires that at least one tile from a tileset (A Beach and A Cave) be on every screen. I decided to make a level for it, despite not being a member of the Nifflas Forums. Anyway, here is the level! It is one of those levels where you just wander around without much to challenge you in particular, although there is a challenge corner tucked away in here. There are 5 endings, most of which I wish I had done better. I like to think of this as a love letter to summer, kinda. Hope you enjoy it!